If you had a formal church wedding the first time and want to bring back some of the romance and excitement of your wedding day, Viva Las Vegas is the place to do a thrilling wedding vow renewal ceremony. And we have all the options. You can choose a romantic, traditional ceremony just like your first wedding, or a fun and crazy Vegas-style wedding package, the one you may have wished for the first time, but didn’t dare go through with. That’s what a vow renewal is all about. It’s the fun wedding in Vegas! 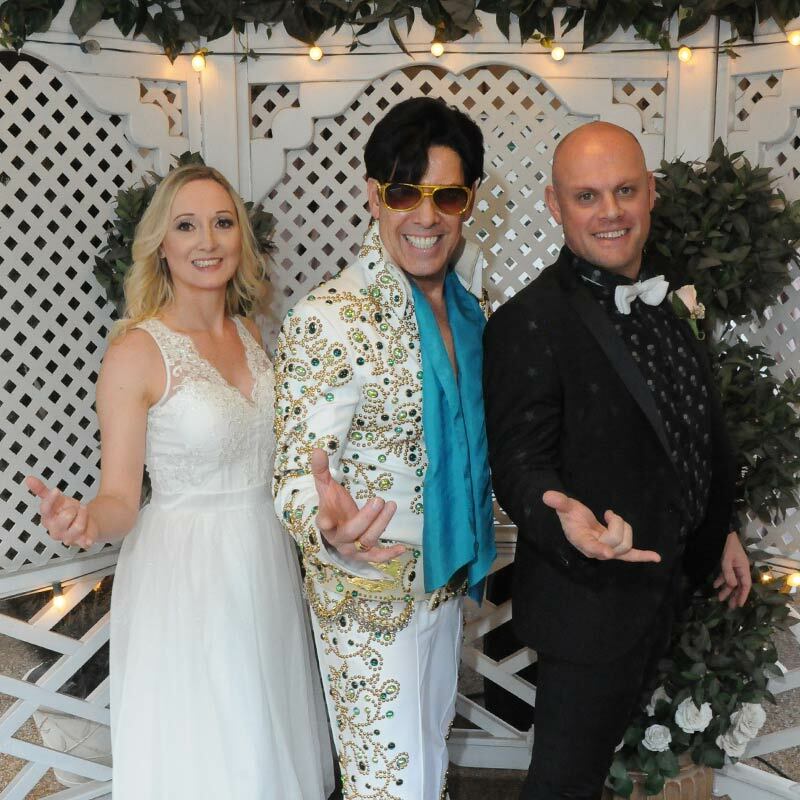 Because second weddings are all about fulfilling fantasies, your wedding ceremony can be performed by any of our iconic wedding “ministers”— Elvis, a Liberace or Tom Jones impersonator, even James Bond or Dracula! 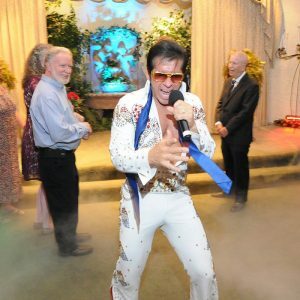 Any of our Elvis, themed or traditional wedding packages can be performed as wedding vow renewals or commitment ceremonies—no wedding license required! After the ceremony, the happy couple will see their names in lights on our marquee, right on the Las Vegas Strip. It’s the most amazing Vegas photo-op ever! Celebrating an anniversary? A wedding vow renewal in Las Vegas is the perfect way to commemorate a 10th, 25th or even Golden Anniversary! We can even arrange for a surprise renewal, which we’ve done many times, planning in cahoots with the grown children of parents for their 35th or 50th wedding anniversary. As you make all the arrangements with us at Viva Las Vegas Weddings, you’ll experience professional and courteous service from our highly-trained staff. We’ll make sure to get every detail right for this special occasion, from flowers to transportation to music. We offer the most choices in Las Vegas for fun and romantic vow renewal and commitment ceremonies, and we’ll cheerfully help with all aspects of your decision-making process. Not an Elvis fan? 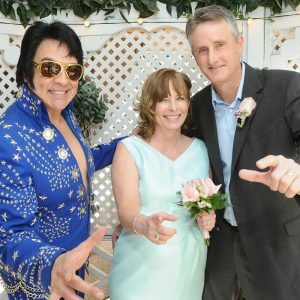 Viva Las Vegas Weddings also offers unique themed wedding vow renewal and commitment ceremony packages. Choices include the Camelot Wedding (with knights as attendants and either King Arthur or Merlin to officiate), the Egyptian Wedding Ceremony with King Tut, the Austin Powers 60’s wedding package, and even an Intergalactic Themed Wedding, for fans of Star Trek or Star Wars movies. Most of our packages include video, photography, super-stretch limousine service, flowers and more. From traditional weddings to elaborate themed affairs, Viva Las Vegas Wedding Chapel promises to make your wedding vow renewal or commitment ceremony an event to remember. We’re honored to be a part of your special day. And, we just know that one of our award-winning Las Vegas weddings will be right for the two of you as you renew your heartfelt wedding vows.